CD4 cell counts give an indication of the health of your immune system. Your CD4 cell count should go up when you take HIV treatment. Monitoring CD4 cell counts is less important while taking HIV treatment than before starting. CD4 cells are white blood cells that play an important role in the immune system. Your CD4 cell count gives you an indication of the health of your immune system – your body’s natural defence system against pathogens, infections and illnesses. CD4 cells are sometimes also called T-cells, T-lymphocytes, or helper cells. 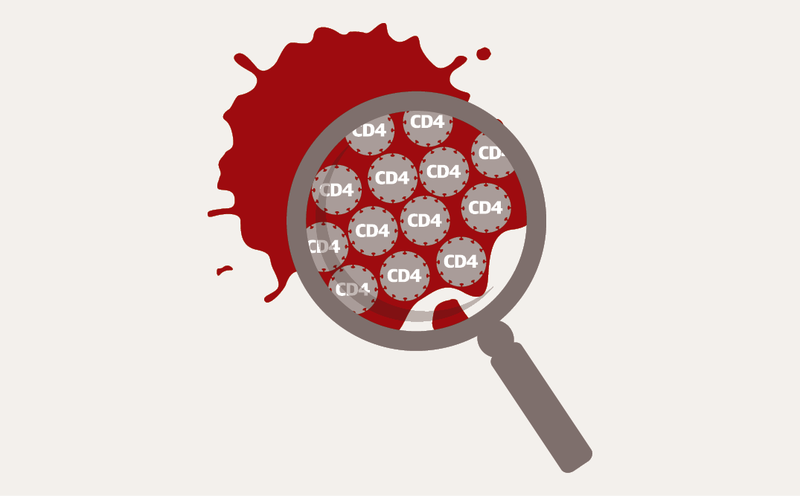 Your CD4 cell count is the number of blood cells in a cubic millimetre of blood (a very small blood sample). It is not a count of all the CD4 cells in your body. A higher number indicates a stronger immune system. The CD4 cell count of a person who does not have HIV can be anything between 500 and 1500. People living with HIV who have a CD4 count over 500 are usually in pretty good health. People living with HIV who have a CD4 cell count below 200 are at high risk of developing serious illnesses. HIV treatment is recommended for all people living with HIV. It is especially important for people with low CD4 counts. If you have HIV and do not take HIV treatment, your CD4 count will fall over time. The lower the CD4 cell count, the greater the damage to the immune system and the greater the risk of illness. When you take HIV treatment, your CD4 count should gradually increase. In the past, CD4 cell counts were used to guide decisions about when to start HIV treatment. However, we now know that all people living with HIV can benefit from HIV treatment and that it is better to start treatment sooner, rather than later. "When you are taking HIV treatment, your viral load is a more important indicator of your health and of the effectiveness of your treatment than your CD4 cell count." Monitoring of your CD4 cell count is still important soon after diagnosis with HIV, before beginning HIV treatment and for as long as your CD4 count is low. It provides important information about disease progression and the immune system. If you have chosen not to start HIV treatment for the moment, then keeping an eye on CD4 count will help you and your doctor assess how safe it is to continue without treatment. For example, if your CD4 cell count is 200 or below, you are at risk of developing some serious illnesses and infections. Your doctor should recommend that you start HIV treatment urgently, without delay. If your CD4 cell count is low, your doctor should also offer additional drugs to try prevent these infections, known as prophylaxis. You should take prophylaxis whether or not you take HIV treatment. For example, you may need cotrimoxazole (Septrin) to prevent PCP pneumonia until your CD4 cell count rises above 200 while on HIV treatment. If you have a lower CD4 cell count, then you may have some additional tests, for example screening for tuberculosis (TB). Once you start taking HIV treatment, and your viral load starts to fall, your CD4 cell count is likely to increase gradually. The rate at which this happens can vary a lot between individuals. During your first months taking HIV treatment, your CD4 count will continue to be monitored regularly. Nonetheless when you are taking HIV treatment, your viral load is a more important indicator of your health and of the effectiveness of your treatment than your CD4 cell count. After a while, your doctor may suggest checking your CD4 cell count less often. If you have had an undetectable viral load (see Viral load) for at least a year and your CD4 cell count is over 200, your doctor may suggest monitoring your CD4 cell count once a year. If you have had an undetectable viral load and a CD4 cell count over 350 for at least a year, then your doctor may feel that CD4 cell counts are not needed at all – so long as your viral load remains undetectable. However, if your viral load increased, or you had HIV-related symptoms, then your CD4 cell count would be monitored again. CD4 cell counts can vary a lot between people. Your own CD4 cell count may go up and down in response to different factors such as exercise, lack of sleep or smoking. But these factors don’t seem to make any difference to how well your immune system can fight infections. Rather than attach too much significance to an individual test result, it makes good sense to monitor any trends in changes to your CD4 cell count over time. It’s best to have your CD4 count measured at the same clinic and at roughly the same time of day wherever possible. If you have another infection, such as the flu or an outbreak of herpes, talk to your clinic about whether it is best to delay your CD4 count until you are feeling better. If you get a result that is very different to that expected, your doctor may want to repeat the test to check whether the first result was a laboratory error. In addition to using a test to count the number of CD4 cells, doctors sometimes measure the proportion of all white blood cells that are CD4 cells. This is called a CD4 cell percentage. Although it’s not recommended that CD4 percentages are used as a general indicator of the health of an adult’s immune system, there can be situations where it is a useful measurement. For example, if your CD4 percentage is very different to your CD4 cell count, it might be a sign of another health problem. One circumstance when your doctor might measure your CD4 cell percentage could be if there is a big variation in your CD4 cell count between one test and the next.